“Fun Home” Makes History for Women & Gay Rights With 5 Tony Awards! Congratulations to everyone involved with the Broadway musical, Fun Home, which won five Tony Awards last night including the award for Best Musical. Based on Alison Bechdel’s best-selling graphic novel of the same name, the musical version Fun Home is the first full-scale Broadway production of a lesbian coming-of-age story. The play’s success last night is a triumph both for women artists and for gay rights. 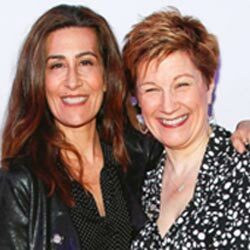 Lisa Kron (book and lyrics) and Jeanine Tesori (music) made history by becoming the first female team to win a Tony Award for Best Original Score of a Broadway musical for their work on Fun Home. The show also won for Best Book of a Musical (Lisa Kron), Best Direction of a Musical (Sam Gold), and Best Lead Actor in a Musical (Michael Cerveris). WomenArts is especially proud of Lisa Kron, who participated in the League of Professional Theatre Women’s SWAN Day 2009 panel discussion at Lincoln Center Library with WomenArts Executive Director Martha Richards. Kron has been a ground-breaking artist from her early days as one of the Five Lesbian Brothers through her autobiographical plays, 2.5 Minute Ride and Well. It is wonderful to see such a long-standing feminist being recognized as one of the leading voices in American theatre. In Lisa Kron’s acceptance speech for Best Book of a Musical, she talks about a recurring dream in which she discovers that her apartment has many undiscovered rooms. She compares Broadway to a house where everyone has been staying in the living room, and she urges everyone to check out all the other rooms where people have been doing beautiful but unrecognized work. We are also thrilled to see the work of Alison Bechdel reaching larger audiences. For decades Bechdel was best known as the author of the comic strip, Dykes to Watch Out For, which was a popular fixture in lesbian newspapers, but was little known in the mainstream world. One of the characters in her strip once said that she would not go to a movie unless it had at least two female characters who talked to each other about something other than men. This criteria for evaluating films became known as “the Bechdel Test” and has been widely used by feminists to discuss films, plays, operas, and literature in recent years. Bechdel’s graphic novel, Fun Home, was published in 2006. She followed that in 2012 with another graphic novel, Are You My Mother? In 2014 she was awarded a MacArthur Foundation “genius” grant. 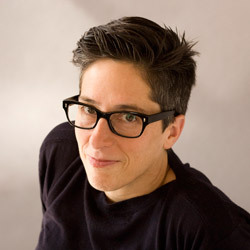 Fun Home is based on Alison Bechdel’s complicated relationship with her father, who was a closeted gay man. The book and the play are poignant reminders of how much attitudes about homosexuality have shifted over the past three decades. Bechdel’s father committed suicide shortly after she revealed to him that she was a lesbian. The play contrasts the happiness that college-age Alison finds when she discovers her sexuality and announces it publicly with the pain her father experienced from being in the closet. In 1980 it was inconceivable that a story featuring a young woman singing about the joy of her first lesbian encounter would be a hit Broadway musical, and it is important to remember that homophobia is still alive and well in conservative parts of the U.S. In March 2014, the Republican-controlled South Carolina House of Representatives cut the College of Charleston’s funding by $52,000 to punish the school for including Fun Home in its “College Reads” program for incoming students. Since the majority of Broadway shows are still written by men and do not pass the Bechdel test, it is an incredible and inspiring breakthrough to have a musical by and about lesbians winning five Tony awards. Three actresses play Bechdel at different stages of her life – Sydney Lucas as young Alison, Emily Skeggs as college-age Alison, and Beth Malone as adult Alison. All three Alisons and Judy Kuhn, who plays Alison’s mother, were nominated for Tony Awards. WomenArts also congratulates Marianne Elliott, who won for Best Direction of a Play, for her work on The Curious Incident of the Dog in the Night. You can check out a photo collage of all the women who won Tony Awards this year or you can get more information about other Tony Award nominatees and winners at www.tonyawards.com/ . This entry was posted in Theatre, Women Leaders in the Arts on June 8, 2015 by Martha Richards.